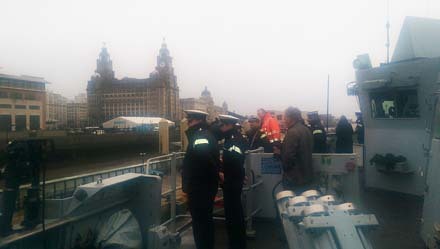 From 24 to 26 February the Master, accompanied by Assistant Simon Wood, had the great privilege to be guests on board HMS Lancaster during a transit from Portsmouth to Liverpool. Also in the VIP party was the Mayor of Lancaster who later in the week was to welcome the ship’s Company in their first official “home town” visit in eight years. The main purpose of the voyage, however, was for the ship to undertake a range of seaworthy trials in preparation for her nine month deployment commencing in March to the Caribbean and beyond. We were collected from Portsmouth Harbour Station at 8am on a bright and blustery morning by Lt Susie Williford, the ship’s navigation officer and, once on board, we were introduced to Lt Cdr Nick Johnson, our new affiliate officer who has taken over the reins from Lt Cdr Adrian Gubby. At 10am precisely, we slipped away from Portsmouth into the Solent. 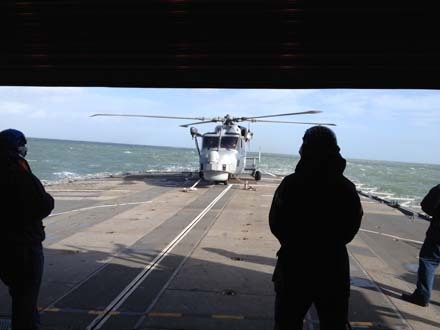 Skirting around the Isle of Wight, the weather started to deteriorate as the ship’s new Wildcat helicopter flew in from RNAS Yeovilton to execute a textbook landing on the aft deck prior to undertaking her own seaworthy trials. 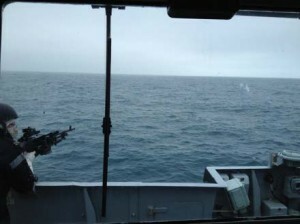 After spending a relatively quiet night in Lyme Bay, operations resumed the following morning, commencing with gunnery trials of the ship’s deck-mounted 7.62 miniguns and GPMGs as we headed into the prevailing storm with live ammunition and tracers skimming across the angry-looking waves. By this time, weather conditions could only be described as atrocious, with visibility from the bridge very restricted. A great contrast, in other words, with the warm, calm weather seemingly experienced by those Feltmakers (Jane Way, Nick Lee and Rob Wallbank) fortunate enough to have been on board last Spring. A pod of dolphins surfaced to find out what was disrupting their midmorning work out. Below deck, your seafaring Feltmakers were offered a full range of briefings on weapons, engines, navigation and logistics. 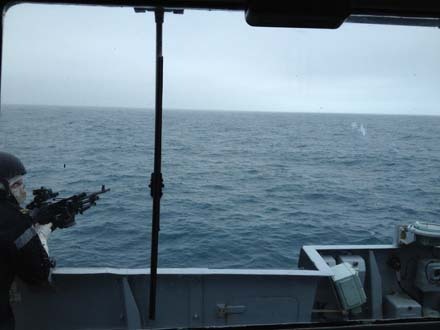 HMS Lancaster has a wide range of engine configurations, from gas turbines to electric motors, the latter enabling the Ship to engage in anti-submarine warfare virtually undetected by the enemy below. By the time we were sailing up through the Irish Sea, the storms had abated somewhat and during the evening before our arrival into Liverpool we all watched a DVD of, appropriately, “Master and Commander”. 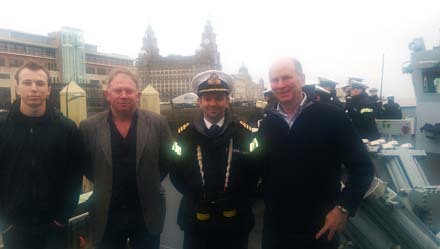 Commander Peter Laughton MBE RN and the rest of the ship’s Company extended a very warm welcome to us during our stay. Over dinner and lunch in his Commanding Officer’s suite below the bridge, he gave us some very interesting insights into the ship’s operational capabilities and the plans for her forthcoming deployment. Commander Laughton said he was uniquely privileged to have been able to achieve all of the five objectives he had set himself when assuming command in November 2013, namely (i) to hold a Families’ Day (ii) to hold an Affiliates’ Day (iii) to welcome Her Majesty on board (iv) to organise an official “home town” visit and (v) to entertain as many as possible of the ship’s former commanding officers to a dinner on board HMS Lancaster to take place before her deployment. “I am absolutely thrilled to bring HMS Lancaster to the Port of Liverpool in order to re-affirm our strong links with the City of Lancaster”. “Sailing from Portsmouth earlier this week, it has been a wonderful privilege to be joined onboard by some of our affiliates including the Mayor of Lancaster and the Master of the Worshipful Company of Feltmakers”. 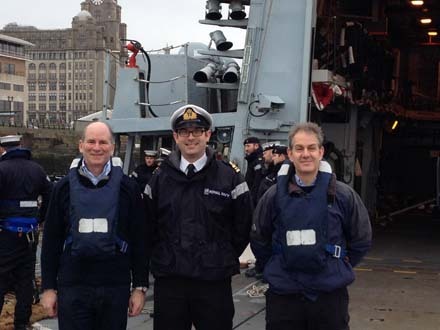 Needless to say, we as Feltmakers were hugely impressed by the professionalism, commitment and good humour of HMS Lancaster and wish her and her Company all the best over the course of the nine months of her deployment.